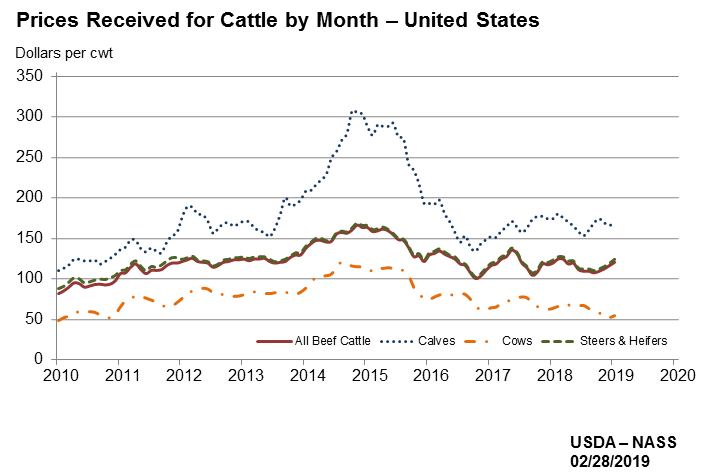 US Cattle Herd Expansion Continued in 2018 – What Affect Will this Have on Cattle Prices in 2019? 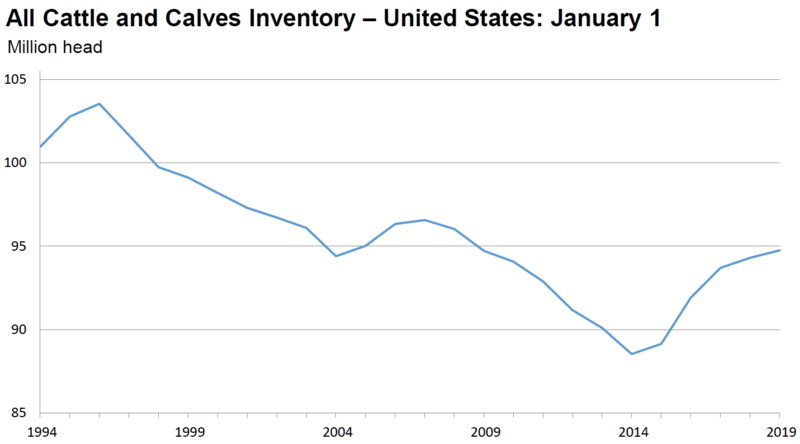 Each year USDA provides a summary of the US cattle inventory at the end of the previous year. Typically this report comes out in January, but due to the government shutdown, this report was delayed until February 28, 2019. The January 1 Cattle Inventory Report provides a snapshot of the direction of the industry. Market economics are primarily affected by two factors, supply and demand. Based on the recent report, the supply of cattle increased again in 2018 for the fifth straight year. When you compare the current inventory to the adjusted report from 2018, there are several signs that herd expansion slowed down last year, and may not continue in the future. All cattle and calves in the US was up to 94.8 million, which was only a slight increase from 94.3 million in 2017. The total number of cattle on feed rose 2%, with 225 thousand more cattle in the feedyards than the previous year. Cows that calved increased 1%, but that increase came from from beef cows, as dairy cows decreased 1% from the previous year. 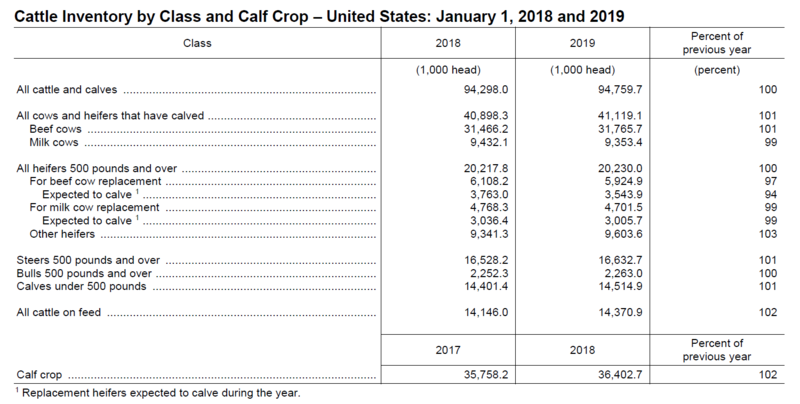 The 2018 US calf crop was estimated to be 36.4 million head, which was 2% more than the previous year. Interestingly the report also broke down when these cows calved, as 73% were born from January through June, as compared to only 27% in the second half of the year. Beef replacement heifers actually decreased 3%, which likely signals the end of the expansion phase of the beef industry. It is also interesting to look at the local situation in the Southeast. Overall there was only a slight increase in the number of beef cows that calved last year, less than 1%. However, there was a significant increase in Florida, Georgia and South Carolina, but a major decrease in Mississippi, and a slight decrease in Alabama. Ranchers in South Carolina retained 32% more replacement heifers than the previous year, and 13% more heifers were kept in Florida. Overall USDA reported a 3% increase in replacement heifers, as compared to a total decline of 3% across the US. The Southeastern beef herd is still expanding. So what does this mean for cattle prices this year and in the future? The feedyards already have more cattle on feed than the previous year, and will have an even larger supply, as the calves born last year continue through the supply chain. When supply increases, prices normally fall, unless demand increases as well. Last year, because of a significant increase in export demand, cattle prices held fairly steady until the fall run of cattle. South Korea is not hosting the Olympics in 2019, so this spike in demand (+35%) may not be maintained. The most optimistic early price forecasts, made prior to this report, expected similar prices to last year, but many economists are expecting prices to decline, as this larger calf crop increases overall beef supply later this year. As noted earlier, 73% of the calves last year were born in the spring, so the big influence on feeder calf prices may come later in the fall. This early in the year, it is difficult to predict, but downside risk management for cattle seems wise, based on this report.